I just love getting mail. And since I work 6a - 6p & the mail room at my apartment complex is only open from 8a - 5p, when I DO finally find time to pick up my mail, it is literally like Christmas morning. A new delivery I have added to my snail mail game? 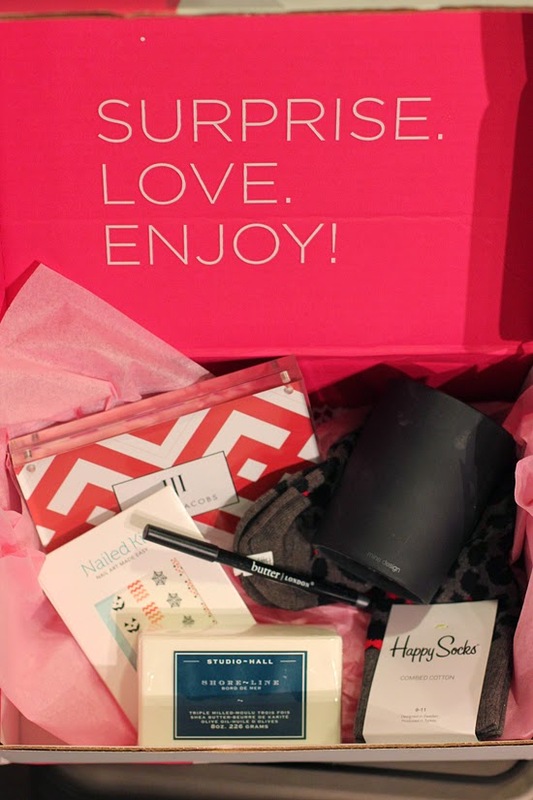 The POPSUGAR Must Have box. This subscription box service is so fun because you don't really know what you are going to get, but you do know that it will always be GOOD! 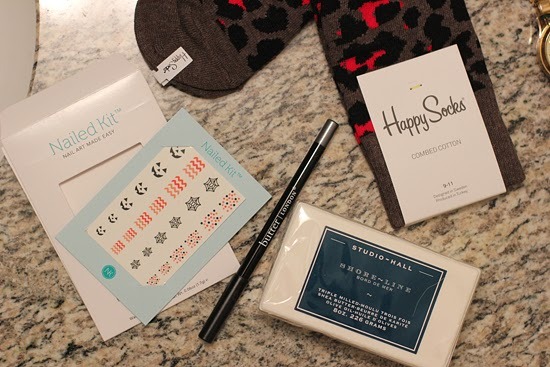 This month they dished up fun socks from Happy Socks, a new eye pencil from Butter London (love the subtle gray shade! ), new acrylic frame from Isaac Jacobs International, super cute chalkboard candle from Mine Design, Dean & DeLuca pumpkin spice malt balls*, halloween nail decals by Nailed Kit, & yummy soap from K. Hall Designs. *not pictured because we ate them immediately upon opening the box (#badblogger)… & they were delish! 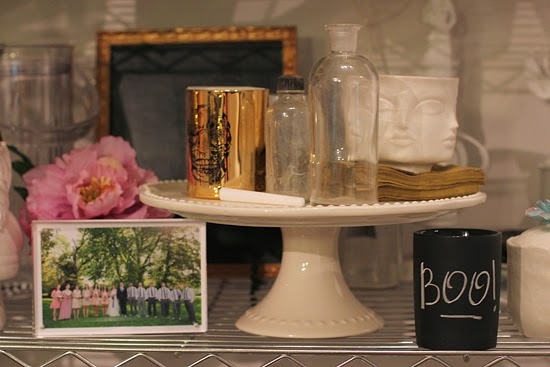 My friend Kate (& blog photog) recently came over & commented that my tchotchke game was on point… I couldn't help but giggle because I DO love a good doo-dad & since we moved they are all living in one centralized place on these wire Target shelves. The plan was to disperse them all throughout the house, but now I am kind of in love with the tchotchke display en masse. And now how great does the chalkboard candle and acrylic frame look added to the mix? I think they will fit right in! Cozy night of pampering coming right up! These socks are crazy good, & I can't wait to hear what my students think about my new nail action! *makes a great anytime or holiday gift too! Happy Socks are the most comfy! So I'm currently subscribed to BOTH ipsy and Birchbox. Trying to get down to just one, but maybe I'll just swap one ;) I love that they give you a wide variety of products, make-up, apparel, decor, etc. Those nail decals look so fun, I hope you share your mani on the blog! Have a wonderful weekend, girlfriend! 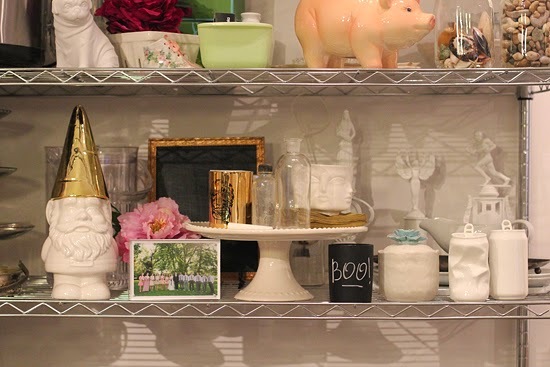 Oh- and I love your knick-knack shelf. I'm gonna get there fast if I'm not careful! I just love that kinda stuff! I looove receiving my PSMH box every month! I like the way you displayed the frame and candle together- soo cute!! The nail art is super cute.